Life Coach, BPD and Mental Health Coach, A.J. Mahari, in a video, asks how mental illness can even actually really be adequately defined let alone defined as practically anything and everything psychiatry feels like pathologizing according to the newest version of their “bible of psychiatry” – the DSM 5. Dr. Niall McClaren, an Australian Psychiatrist for over 35 years, believes that the DSM 5 goes way too far and far enough or beyond far enough to diagnose practically everyone with some form of what they’d define as a mental illness requiring drugs. Psychiatry, biopsychiatry, and the DSM 5 are so out of control, they could now find reason within their own “bible of psychiatry” to diagnose a “ham sandwich” with just about anything. No one oversees the “working group” who write each version of the Diagnostic Statistical Manual (DSM). The “working group” of psychiatrists who write, essentially whatever they want, based often on “theories” they now purport to be positive proof science that is really more Big Pharma funded pseudo-science instead. No one, not even with in the “profession” of Psychiatry gets to change or stop whatever the “working group” decides to list as a mental illness and establish some “diagnostic criteria” for. As, Dr. Niall McClaren, M.D., an Australian Psychiatrist has said about the out-of-control nature of his own profession, Psychiatry, and more to the point Big Pharma funded biopsychiatry (the belief that mental illness is a brain disease or disorder that needs to be medicated) which is really just an attempt to make big money selling Big Pharma’s very dangerous psychiatric meds. Also, Dr. McClaren, believe that what has risen with this Big Pharma industry merging with Psychiatry, first in the United States is an attempt on the part of the “profession” to try and establish themselves as “real doctors” like medical doctors (at the patient’s expense, literally, and psychologically). They are trying to legitimize themselves as medical doctors by forwarding an unproven and dangerous notion of “science” that all mental illness (which they’ve really never defined in the sense that they have not ever defined mental health) is biological – which of course it isn’t. They want people to believe this for their own purposes and benefits and not for the benefits of their patients. Psychiatric medication in Canada, like elsewhere in the world, is killing people and causing them to do violent things. How is that helpful to anyone? What is wrong with psychiatry? Every mental health consumer needs to know more about the junk science of psychiatry and its made up mental illnesses and its use of drugs that are killing people and causing people to kill each other. Psychiatrists are making stuff up to sell medication and make money. There is not credible evidence that what biopsychiatrists call mental disease or disorder is junk science and the psychiatric medications have been prescribed dangerous psychiatric medications to 540 million people. Psychiatrists say they don’t know what causes mental illness but yet proclaim themselves as mental health experts. Psychiatrists cannot point to a single cure. Is Psychiatry a perverted instrument to control you? Dr. Thomas Szasz, Professor of Psychology Emeritus talks about how ADHD is not a disease. He mentions that when he was in University 60 years ago there were 6 or 7 psychiatric illness whereas now there are over 300 with “new” ones being “invented” (made up, really) every day. The National Alliance on Mental Illness (NAMI) until recently was reluctant to reveal the source of its funding. But thanks to Sen. Grassley we now can learn NAMI’s sources for Major Foundation and Corporate Support, which you can find here. I downloaded the list of “funders” for 2009. Fortunately, unlike pharmaceutical companies who have revealed monies paid to physicians (see, for example, “Transparency Vs. Translucency in Reporting Physician Payments“), NAMI’s numbers are easy to copy into Excel spreadsheets and analyze. In 2009, NAMI received 84 payments over $5,000 from different sources. Payments total $4,737,610.00 of which $3,836,750.00 (81%) came from major pharmaceutical companies. 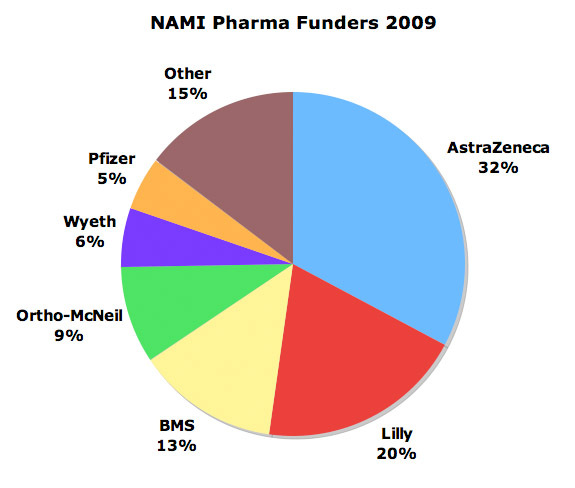 The following pie chart shows how the $3,836,750.00 was divided among major pharma funders (click on the chart for an enlarged view). The biggest pharma funder in 2009 was AstraZenca (AZ), which donated $1,255,000.00. Recall that AZ is forced to pay about 400X that amount ($520 million) to resolve allegations that it illegally marketed the anti-psychotic drug Seroquel for uses not approved as safe and effective by the Food and Drug Administration (see HHS press release here). I guess you might say AZ got a large NEGATIVE ROI for its NAMI investment! Lilly was next on the list having donated $750,500.00 to NAMI in 2009. Recall that Lilly markets Cymbalta and that it recently received a warning letter from the FDA about misleading a Cymablta print ad — ie, re: “omission of risk information.” Cymbalta is indicated for treatment of depression among many other things these days (see “The Cymbalta Buzz Machine is at Full Throttle!“). The third biggest NAMI pharma “funder” for 2009 was BMS, which donated $506,250.00. Recall that BMS markets the drug Abilify for bipolar disorder. Some time ago, Andy Behrman — BMS’s patient spokesperson for Abilify — went on a campaign against the very product he endorsed for money (see “Andy Behrman, Now an Anti-BMS Spokesperson, Says ‘Ask Your Doctor If Abilify is Wrong for You’“). It’s a crazy, crazy world out there in the marketing of mental illness drugs! Author of “Anatomy of an Epidemic” talks about re-thinking psychiatric care – psychiatric drugs are creating a dangerous epidemic and they cause mental health patients to die, in many cases, 25 years sooner than those who do not have mental illness and more specifically who do not take these drugs. Does science back up the model of the medical model of psychiatry? Listen to Robert Whitaker, author of, “Anatomy of an Epidemic”. Psychiatric drugs cause more harm than they do good. They are not backed up by sound science and this is a must-see video. Robert Whitaker, author of Anatomy of an Epidemic: Magic Bullets, Psychiatric Drugs, and the Astonishing Rise of Mental Illness in America was the keynote speaker on February 10, 2011, in Portland Oregon. It was a “Rethinking Psychiatry Event”. Psychiatry must be given more than a second or third thought these days as it is driving itself off a cliff and becoming less and less a viable realistic ethical or trustworthy vehicle to actually treat and help patients. The focus on the “medical model” of psychiatry, known as Biopsychiatry is doing more harm than good prescribing medications that are harmful in many cases without full disclosure of the potential harm of many psychiatric medications and doing so it would seem more to earn Big Pharma money than to actually help people with recovery and getting well. More than 450 people filled the Unitarian Church in Portland Oregon February 10th for the Rethinking Psychiatry event. Robert Whitaker keynoted the evening, followed by a panel with Beckie Child, Director of the Mental Health America of Oregon; Cindi Fisher, Movement of Mothers Standing – Up – Together: Taking Back Our Children; Chris Gordon, Assistant professor of Psychiatry at Harvard Medical School, Medical Director of Mental Health Advocacy; Gina Nikkel, Director of the Oregon Association of Community Mental Health Programs; and Will Hall, Director of Portland Hearing Voices. Is psychiatry an industry of death? Do we have an epidemic of mental illness or an epidemic of psychiatry? Psychiatry has invasive and destructive practices. Who are they really serving? Many would say, they are only serving themselves. Going all the way back through the history of psychiatry it becomes clear that psychiatry is not a science and in the present climate of the medical model of biopsychiatry which is being mass-marketed by Big Pharma from which many psychiatrists are getting very rich in the name of disservice to the very people they have an ethical responsibility to actually help and support. What is going on in psychiatry? How could it be an industry – an industry of death? So many people take for granted that to be emotionally and/or psychologically stressed, to be out of balance, to experience what is referred to as “mental illness” means that one is “abnormal” and that is often judged or defined as “insanity”. Who does this benefit? What happens to people when they believe they are “less than” or “insane”? Among other things people feel shame, they feel not-good-enough, broken, isolated and/or alienated. They often not only become disconnected from others but even more importantly they become disconnected from self. This is a state of emotional distress. Emotional distress, even difficulty coping does not “insanity” make. I know, as a Life Coach and BPD/Mental Health Coach, that more and more people are looking for alternative ways to find balance and healing in their lives. Coaching with me is one of those other alternatives. It is my hope that more people will educate themselves about the hidden agenda of biopsychiatry and come to realize that the DSM’s are created by the “profession”. They are largely made-up disorders by those in cohoots with Big Pharma to make money. They are not about helping people with mental and emotional stress and distress. Psychiatry cannot really distinguish mental illness from mental health. How can they know the difference when they make up what mental illness is in their “brain based biologial approach”. For more in this video series please visit ThePepiTube on Youtube. Big Pharma is not in the business of health, healing, cures, or wellness. They are in the business of making money and marketing dangerous drugs to you without all the information that you need and deserve to have. This is true of both drugs for physical as well as psychiatric conditions. Listen to what a former pharmaceutical sales representative, Gwen Olsen, has to say about the pharmacuetical industry. Biopsychiatry, the so-called medical model of psychiatry, which is pseudo-science, junk science, massively marketed but not scientifically proven at all is pathologizing human experience. People are being unethically treated. People are being abused. There is increasing abuse of power on the part of many psychiatrists who continue to follow the blind leading them with this supposed “medical model” of “treatment” and continue to schedule 10-15 minute appoinments for the purpose of prescribing dangerous medication. Where’s the help in that? Where’s the best interest of patients in that? Fitting 4 people into every hour is lucrative for a biopsychiatrist. Does biopsychiatry care that it is exploiting the very people it is mandated to help and to serve? It can be argued that biopsychiatry serves no one except the biopsychiatrist and the pharmaceutical industry. The over-lap between many biopsychiatrists and drug money from Big Pharma is increasing at an alarming rate. How can patients be served by psychiatrists in the back pocket of Big Pharma? It’s a money grab, it’s not ethical medical/psychiatric treatment at all. Psychiatric drugs have many adverse side-effects. On top of that, many are not even properly studied before being mass-marketed to mental health consumers. Many of the known side-effects of these drugs aren’t adequately communicated to patients, if communicated at all. Biopsychiatry is about social control now. It is not treatment. There is no such thing as normal. In fact, biopsychiatry justifies itself by the money it makes not anything to do with actually helping people or even demonstrating compassion for people. Biopsychiatry is an unethical money-grab. There is no such thing as normal. Ask yourself, how then, can biopsychiatry truly even begin to perfect the “art” of categorizing what is so abnormal? Biopsychiatry is pathologizing the human experience. A small number of psychiatrists are the actual authors of the Diagnositc Statistical Manual (DSM) that is known as the bible of psychiatry. It is the book from which all labels, categories, and diagnoseable disorders come. It is something that has a process whereby a select group of professionals write and organize all of the disorders and classifications of “mental disorder” or “mental illness”. And then, get this, they (who “they” are in numbers is again, not a large group) then vote on what gets included and what doesn’t. That’s right, they vote. Does that sound scientific to you? If you go to a psychiatrist for yourself, a loved one or a child of yours is seeing a biopsychiatrist, be armed with questions and information. Today’s brand of psychiatrist is not some demi-God to just be believed. He or she may well not have your best interests at the forefront of their “treatment”. They may well be in the pocket of the pharmaceutical industry and you will/your loved one or your child may be prescribed psychiatric medication, most of which has never been proven to actually do what they claim it does. It is this very medication that is actually the only proven and known cause of any chemical imbalance in the brain. That is to say, mental illness, or having trouble coping, or being in distress, does not, I repeat, DOES NOT mean you have a chemical imbalance in your brain. Read more about the professionals who disagree with the “party line” of psychiatry (biopsychiatry today). Biopsychiatrists don’t see you. They don’t hear you. They have been indoctrinated into believing that mental illness is a brain disease and that the pills they give you are “treatment”. Biopsychiatrists are pathologizing human experience to hold onto and/or increase their own importance, power, and ability to make money. That’s not about you. That’s not going to help you. Biopsychiatrists are not listenting to you or to your experience. They are more concerned with getting you on medication that can and will make you a “mental health consumer” for life. That’s lucrative for the entire system. How does that benefit you? Are you surprised to read this? Do you feel shocked that many of these biopsychiatrists aren’t ethical? Have you just believed them without questioning them? Do you believe that medication is the answer to your distress? It really isn’t, you know. Biopsychiatrists, by the very nature of their belief in a) almost anything and everything felt by people as being a mental illness – a brain disorder – b) their not taking the time to actually hear you, talk with you, understand and actually evalute the context of what you tell them, are pathologizing and dehumanizing human experience. That is to say, so much of human experience that can be distressing or that people come to experience without the skills to cope effectively does not mean there is a diagnostic label that fits all or that everyone in distress is even mentally ill at all. Empower yourself. Research this more. Keep an open mind and know that the quality of your life, should you need help from the Mental Health System, depends upon it. You need to be an advocate for yourself, your loved one, or your child. © A.J. Mahari, August 31, 2010 – All rights reserved. Life Coach, and author, A.J. Mahari, interviewed Dr. Dan L. Edmunds on the Psyche Whisperer Radio Show Monday August 30 at 7pm EST. Biopsychiatry violates the first oath and ethic of medicine for all doctors, including psychiatrists, “first do no harm”. Dr. Dan L. Edmunds views biopsychiatry as “supposed treatment” and doesn’t believe in the common pratice of using toxic psychiatric drugs and especially when it come to children who are then made life-time psychiatric patients. He maintains it is cheaper to “treat” with drugs rather than actually address the reasons for patient’s distress. He believes that science and ethics must become consistent and that the entire mental health system needs to be deconstructed. The medical model needs to replaced with a model of compassion. Maybe then, we can have a humane system wherein abused of the past and current abuses could become things of the past. Professor Dr. Dan L. Edmunds is a radical psychotherapist, a friend and advocate of psychiatric survivors, and a critic of the mental health establishment. Dr. Edmunds is a voice for the marginalized and for the many who lack a voice within the psychiatric system. A person of deep compassion and principle, Dr. Edmunds is a noted psychotherapist, child development/behavioral specialist, Comparative Religion scholar, sociologist and counselor working with both children and adults. Dr. Edmunds speaks truthfully and directly and has posed critical questions to the psychiatric establishment and to society as a whole. He has developed approaches towards helping distressed individuals that are compassionate and empowering and encourage self-determination and autonomy. He has been an advocate for social justice, informed consent, and for human rights in the mental health system. Dr. Edmunds has become deeply concerned with the medicalization of human experience and how mental health services have often become ‘mechanical’, not seeking to truly be caring and empathic, limiting consumer choice, and often not providing informed consent. He has sought for care that is recognizes people’s experience and treats them as people, care that is holistic,which recognizes the mind-body-spirit connection, and which takes into account issues of social injustice and how they impact our emotional well being and often shape our possibilities and who we become. Dr. Edmunds has challenged the mental health system establishment to respect persons experience and once again a common healing ground betwen the therapist and client. His writings have often focused on the need for building of community, holistic approaches, and the role of the family as well as social and political processes that lead towards emotional distress. He has challenged stigmatizing labels and exposed the violence that is often inflicted upon individuals by those who claim to be in the role of ‘helper’. He encouraged a mental health system which does not force people into treatments that they do not want, which respects their dignity, and which allows their experience to be heard and validated. POST PSYCHIATRY JOURNAL – Center for Meaning and Relationship POST PSYCHIATRY JOURNAL – Center for Meaning and Relationship. A compilation of articles from mental health professionals and psychiatric survivors challenging the bio-psychiatric paradigm. CHILDREN OUR TREASURE: Meeting Our Children’s True Needs Outside of the Bio-Psychiatric Paradigm CHILDREN OUR TREASURE: Meeting Our Children’s True Needs Outside of the Bio-Psychiatric Paradigm (book) – History of psychiatry, exploring psychiatric human rights abuses and the impact of psychiatry on children. Offers way to create a more humane mental health system. EXPERIENCE: THE SOUL OF THERAPY EXPERIENCE: THE SOUL OF THERAPY – Exploring the the importance of experience in the therapeutic process. Dr. Edmunds has been interviewed on local and nationally syndicated radio programs in regards to these important issues. Dr. Edmunds was born in Tampa, Florida and spent much of adolescent years in Fort Collins, Colorado where he graduated from Fort Collins High School. From his youth, he became active in community and civic affairs and social and political change. Dr. Edmunds seeks for a society that places people before profits and treats all with compassion and equanimity. He served as a director of the Students for Peace and Justice and was involved in various political campaigns as a teen. In 1991, he served as the youngest legislative aide in the Colorado State Senate, serving in the office of State Senator (later U.S. Representative) Robert W. Schaffer. He later became the youngest registered professional lobbyist, being registered in the States of Colorado, Wyoming, and Arizona. He was a volunteer for the Larimer County, Colorado Office of Veterans Affairs. In 1992, he obtained the permission of then Mayor Nicholas Fortunato to develop the Ormond Beach, Florida Youth Commission. He served as a county campaign coordinator for U.S. Representative Corrine Brown’s campaign in 1992. This accorded him the opportunity to transport Martin Luther King III, the son of the slain civil rights leader, to an event at Bethune Cookman College and exposed him to diversity, civil rights, and social justice concerns. As a public intellectual and left libertarian, Dr. Edmunds continues to remain active in political and civic affairs and encouraging a society that is based on equality, peace, and justice. In 2008, Dr. Edmunds organized the Humanist Center for Freethought and Social Activism in order to encourage an end to oppression, ecological responsibility, freedom, equality, and respect for diversity. Dr. Dan L. Edmunds, Ed.D.,B.C.S.A. Biopsychiatric Oppression: Where are all the Dissenting Voices? Author, Life Coach and Mental Health Coach, A.J. Mahari, asks you to think about this question when it comes to biopsychiatry, “Where are all the dissenting voices?” Why would I ask this, you might wonder? What does it mean? Is it important? Ask yourself, are you believing in the pill-driven marketing of the pharmaceutical industry? Marketing that is done through and by the many psychiatrists who are supposed to be involved in objective science? Who do you think is funding all the studies that come back with results saying this, that, and the other thing, any type of mental illness, mental disorder, or even different way of thinking or being these days is, a “brain disease”? Who wins with this junk science conclusion? A conclusion that is all about making money and not one that is really ethically about serving the medical profession, a profession whose first ethic and oath is, “do not harm”. What is really sad, when you start to research more about the all the news, fuss, noise – and dare I say, hype of biopsychiatry, is that way too many mental health consumers are believing what they hear most often. The message delievered most often when it comes to what you need if you have a mental illness, are stressed out, or, hey, if you are different and perhaps having a bit of trouble coping, is that you need to see a psychiatrist (many more of whom are ascribing to the medical model of biopsychiatry) and you need to take this, that, and/or this, that, and the other pill. Pills, drugs, medication, whatever you want to call it is not treatment for the psyche. It cannot address very real human psychological distress. A distress that can come from one’s mind without being directly linked to some biological aspect of the brain. The brain and the mind are not entirely one and the same. Is biopsychiatry mind control? Is this oppression of patient’s well-being, rights, and freedoms? Big Pharma is marketing medication as a science-based treatment for mental illness or psychological distress through the unethical stance of what is now referred to as the “profession” of biopsychiatry. The fact that psychiatric journals (even most book publishers) do not want to publish dissenting professional opinions about what is going on with the claims of biopsychiatry which are put across to the public as actual science is a huge indicator of a wide-spread abuse of power and authority. See the video on this site by Dr. Niall (Jock) McLaren: What’s Wrong with the psychiatric publishing industry? Have you noticed the incredible increase in television commercials that are for psychiatric drugs? With all those dollars of advertising from Big Pharma being pumped into television programs and networks, – ah – could that account for a lack of coverage of dissenting professionals opinions by psychiatrists and psychologists who do not agree with biopsychiatry and who are notably absent on talk shows, in newspaper articles, columns, and even in the profession of psychiatry’s own journals. What is this all about? It doesn’t take a rocket-scientist to know that suppressing dissent or obstructing the opinions of others is more often than not a sign that someone is hiding something. It doesn’t take a rocket-scientist to know that true science, real science is based upon proving claims and upon refuting challenge that must act as a built-in protection against monopoly, abuse of power, false claims, and the oppression of a group of human beings. What do you think biopsychiatry and Big Pharma are hiding from you? How can you find you out? Where can you find those speaking up and out against this? They can be found. You’ll find many such voices on this website. The thing is, you first have to realize that the absence of dissenting voices in all forms of media does not validate the messages that you’ve heard – namely that mental illness or mental disorder = “brain disease” or “brain disorder”. The troubling and perhaps even tragic danger here is that too many people aren’t finding or perhaps even looking for alternative opinions and treatments (more effective and safer treatment) because biopsychiatry and its liason with Big Pharma are dominating the market place. Is the provision of mental health care supposed to be a market-place? Isn’t it supposed to be about helping people get well and helping people cope? Biopsychiatry is not providing treatment, it is providing dangerous drugs for all kinds of things that it defines and categorizes arbitrarily all by itself. Who is policing that? Perhaps the term, “mental health consumer” is a bit misleading? People with mental health issues need help, support, compassion, education, understanding, and they do not need to be thought of as consumers to be marketed to for top dollars. Where’s the treatment in that? Where’s the help in that? Where’s the accountability in that? Where there are messages or claims, or in the case of biopsychiatry, claims made about something being science that is really only, at best, about a theory, an unproven theory, there needs to be healthy debate. For that healthy balancing debate to take place Big Pharma and biopsychiatry would have to take their feet off the necks of the publishing industry, the advertising industry and off of the necks of mainstream media and professional journals. Dissent and constructive criticism, the asking of questions, the proposing of alternative and additional information is what is required for reasonable debate. The kind of debate that can produce useable and helpful information for those in need of psychiatric help – and here’s hoping one day the profession of psychiatry will stop being led around by the nose by Big Pharma money and get back the noble and ethical pursuit of actually giving people much-needed and compassionate care and actual treatment. © A.J. Mahari, August 22, 2010 – All rights reserved.